I would like to start this post off by saying how truly honored I am that Shannon and Doug have asked me to write on this CB site and to be an administrator on Emily’s FB page. When Shannon asked me to write an entry she said it would be good to have an ‘outsider’s view’. Unfortunately I can’t write as an ‘outsider’, I consider them my family, I love them all as my family and I will stand by them always, as my family. My heart breaks as I watch Emily battle this monster known as Neuroblastoma. She has a heart of gold; she is such a loving young lady and for her to be dealt this hand stinks! When I sit and look at her in that big hospital bed hooked up to bags and bags of POISON it takes all my strength to not sit in tears. After all, Emily doesn’t cry … she FIGHTS! She lets the nurses take vitals, answers every doctor’s question, and corrects them when they try to take her temperature by mouth! She even shows them where the next spot is for her shot… Emily is nothing short of AMAZING. This CH14.18 (antibody treatment) causes pain, pain that no 5 year old should have to experience. The doctors minimize her pain with Morphine over and over again and she FIGHTS! The Morphine causes her to break out so they hit her with Benadryl and she FIGHTS! The IL-2 causes fevers and achiness; they give her Tylenol and she FIGHTS! This will go on for 6 cycles, 6 months of torture, IV pokes, platelet transfusions, hospital stays, GM-CSF shots but she keeps on fighting! Emily has touched the lives of so many. Not only are others inspired to fight their own battles, they are often the recipient of the Hubbels’ encouraging words and care packages. If they meet Emily in person, they are awarded her million dollar smile! That can make anyone feel better in that moment, no matter what life has dealt to them. This ‘outsider’ has been taught to look at life differently, to appreciate the little things, and to open my heart and allow room for a new family. 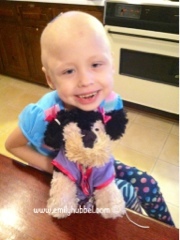 Emily is a fighter, she is my ‘bestest’ friend, and she will be victorious in beating this monster. Emily went inpatient on Monday the 5 for round 2 week 1 iL-2! It was a long week but she mostly handled it really well! She had a couple of fevers throughout the week, extreme tiredness, and some diahreah! We were so proud of her though for doing so well with even having to get an Iv in her arm! Monday and Tuesday Jessie didn't have school so she was able to spend some time with Emily and I in the hospital which Emily seemed to enjoy! Emily did come home yesterday and of course as soon as we got her home and she laid on the couch, she had a bit of a fever! We did tubs and Tylenol and that seemed to help because we haven't had any other fevers! While she has been home we are still having some diahreah though, being tired and extremely emotional! Thankfully she is home for the weekend in our own beds! That always helps! Brianna is having such a harder time now being away from us! The separation is so much harder on her these days! Thank you dad for holding down the fort at home and taking care of Brianna with traveling to see us in the hospital! Monday we head back early for round 2 week 2 iL-2/ch14.18 combo! So back on the morphine and the pain but we hope it is much better this time! Thank you again sue and jojo for coming out this past week and helping out, and we thank you again for coming during this week! Thank you all for your continued support and love and we go through this! This is just a quick update on how things are going! Make sure you hug and kiss your kids goodnight! Emily has had so many help her, love her and support her and she wants to give back! 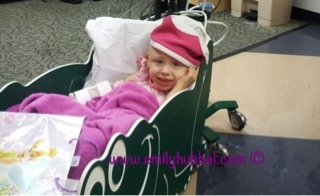 Giving back to the hospitals who have helped Emily will mean so much to our family! Emily's Journey will be doing a band-aid drive for both VCU Medical Center and Helen DeVos Childrens Hospital! Both hospitals band aids in the clinic are done off of donations, and they go thru lots of them! We also hope to be adding in more hospitals should we receive more bandaids. If you were wanting to help with Emily's 1st Annual BandAid Drive, but you don't live close by and you were worried about the shipping cost... well SmileMakers was very happy to be able to offer us a code for not only free shipping but also for 10 off all bandage purchases for this drive! The code to use at checkout is "MissEmily" and will be valid through 12/2/2012. So keep spreading the word. You guys are just amazing. 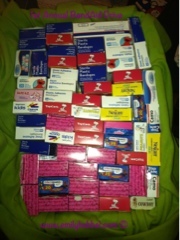 WE WOULD LIKE TO HAVE ALL BANDAID DONATIONS IN BY DECEMBER 3, 2012 so that we can present them to VCU and to Helen DeVos when we make our next trip!